Haystack Rock beneath gray skies. 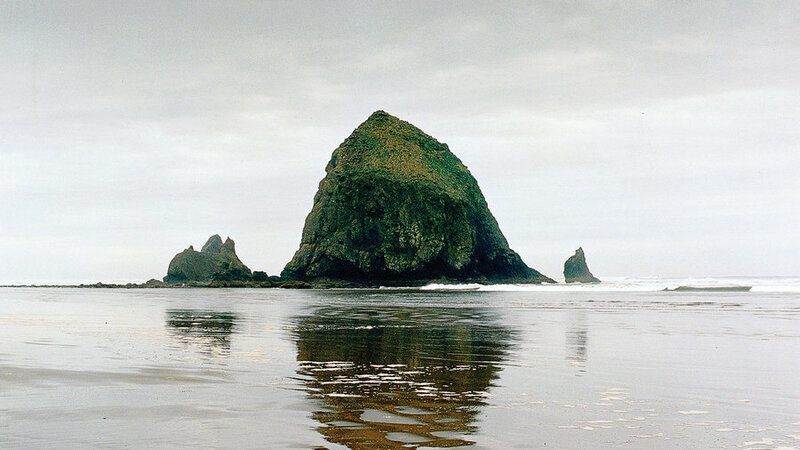 Cannon Beach is about 72 miles northwest of Portland, Oregon, near the junction of U.S. 101 and U.S. 26. For information, see or phone 503/436-2623. Cozy up to the fireplace at the Ocean Lodge (from $179, including breakfast; theoceanlodge.com), which welcomes dogs and kids. For dinner, dive into hearty Niman Ranch short ribs over creamy grits at Gower St. Bistro ($$$; 1116 S. Hemlock St.; 503/436-2729). Start the day with a warm cinnamon roll or two from Cannon Beach Cookie Co. Public House ($; closed Sun–Mon; 239 N. Hemlock St.; 503/436-1129). Then hit Bronze Coast Gallery (224 N. Hem- lock; or 800/430-1055), White Bird Gallery (251 N. Hem- lock; 503/436-2681), and Northwest by Northwest Gallery (232 N. Spruce St.; or 800/494-0741). If you’ve timed your trip right, enjoy the Stormy Weather Arts Festival (Nov 7–9; ticket prices vary; cannon or 503/436-2623 ext. 3), with demonstrations by Northwest artists. Continue the gallery hop and get a jump on holiday gift shopping: Find playful vases at Icefire Glassworks (116 E. Gower St.; 503/436-2359) and art, jewelry, and books at Cannon Beach Gallery (1064 S. Hemlock; or 503/436-0744). Hungry? Tuck into a chicken potpie at the Lumberyard Rotisserie & Grill ($$; 264 Third St.; 503/436-0285).